Before we start this week it might be good that we first refresh our memory as to just what politics are. According to Websters New World Dictionary : “Politics” – the science and art of government; political affairs; political methods, tactics, etc. ; political opinions; factional scheming for power. It is politics that gives us our laws, ordinances, directives, restrictions, requirements, executive orders, etc. These are man’s ways to control citizen activity. Unfortunately, many are not aligned with God’s laws or will and create much concern about what is ‘right’ and what is ‘wrong’. For the next few weeks we will look at situations where Christians were tested by ‘politics’ and see what had to happen to move beyond the situations. As you read about these situations ask yourself what would happen if they occurred in your community? Who would step forward to ‘right’ a ‘wrong’? Where would your church be…in the ‘thick’ of the battle or on the sideline casually observing? Let us now start down the ‘trail of trials’ some Christians have had to deal with…and in the United States. Consider when lawmakers in Tennessee tried to make the Holy Bible the official state book. The sponsoring state senator Kerry Roberts told The Tennessean, a local ‘rag’, that the legislation was meant to commemorate the historical nature of the Good Book, referencing George Washington’s inauguration and his use of the Bible for his swearing in. Roberts told the newspaper that the attitude of people in those days was not to keep religion out of government but to keep government out of religion. [Joel Ebert,”Tennessee Senate Committee Approves Bible Bill”, Tennessean March, 29, 2016]. The newspaper editorial board issued a blistering rebuke of lawmakers who supported this ‘Bible-bill’ calling them theocrats and comparing them to Muslim ayatollahs. The paper claims they were trying to take governing power from the people and give it to religious authorities. [David Plazas,”Tennessee Lawmakers Who Back Bible Bill Are Theocrats”, Tennessean, March 31, 2016]. This concern might have had some validity had those supporting the bill had plans of beheading people, throwing citizens off of buildings, or torturing ministers. The move to make the Bible the official state book is akin to a state having an official vegetable or snack. It would have no discernible impact on people’s daily lives. No forced conversions. The newspaper went on to suggest that the bill was a clear attack on religious minorities and secular, agnostic or atheistic people who are protected by state and federal constitutions. [Ibid]. It even went on to say that the bill was also an attack on religious people who have a strong interest in ensuring that government does not endorse one way to worship God over another. [Ibid]. The very ‘book’ that contributed much to the principles in the constitutions that protected them now needed to be put away so that it would not ‘attack’ them. The lawmaker’s efforts should be commended, after all we are one nation under God. Shouldn’t the Bible be recognized for that freedom contribution? What if we all decided to live by the teachings in the Bible? In finishing this story, Tennessee’s official state beverage is milk. Is the Tennessean going to accuse lawmakers of attacking those who are lactose intolerant? It’s that crazy! Next we will turn to CBS…go figure…to get an understanding of why we as a nation are so confused. News Sunday Morning with Charles Osgood who introduced his guest, Louis Micheal Seidman, a professor of constitutional…yes, I said ‘constitutional’…law at Georgetown University. The question ‘de jour’ was “Is the US Constitution truly worthy of the reverence in which most Americans hold it?” The guest began his commentary with:”I’ve got a simple idea; let’s give up on the Constitution. I know it sounds radical, but it’s really not. Constitutional disobedience is as American as apple pie.” [“Professor: Take Our Country Back, From the Constitution”, CBS Interactive Inc., January 27, 2013]. From that point the anti-Constitution constitutional law professor put forth his quest to take back our own country. He demanded that we stop deferring to an ancient and outdated document. [Ibid]. (I wonder if he includes the Bible as being ancient and outdated?) He went on that we have a right to the kind of country that we want and should not allow a constitution written by people who died over two centuries ago and knew nothing of our country as it exist today. [Ibid]. From the interview one must conclude that the professor truly believes this nonsense…proof that he had access to some of that ‘medicinal stuff’ even back in 2013. Unfortunately he is not alone in his thought processes. There is an effort afoot to undermine not only the US Constitution but also our Founding Fathers. It’s called the “Great Unraveling”. It can be found in thousands of newspapers and in media forms all around us. That’s how unraveling happens…one small thread at a time. If a well established law school such as Georgetown can employ one such as Professor Seidmam and he is only representative of law being taught throughout the nation then no wonder even our Supreme Court has problems with the Constitution. The church is protected by the Constitution. 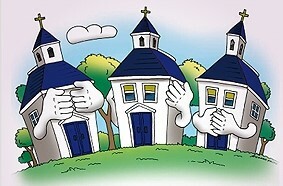 Where’s the church when that ‘protection’ is slowly being torn away? What is your church doing? Next is a story to reinforce why parents and Christian organizations need to get more involved with the education of our children and the system out tax dollars support. In the fall of 2014 the mother of an eight year old told of her son being given a Nation of Islam handout at Harold McCormick Elementary School in Elizabethton, TN. The handout asked,”What does it take to be on Mount Rushmore?” It further went on to explain that George Washington was a ‘prime breeder of black people’; Theodore Roosevelt called Africans “ape-like”; Thomas Jefferson enslaved 200 Africans; as well as Abraham Lincoln. [Sommer Bauer in communication with Todd Starnes, October 2014]. The handout listed a website. The mother was shocked when it took her to the Nation of Islam home page. The Nation believes there is no God but Allah. They are not keen on white or Jewish folks. They were saying that out Founding Fathers were racists. When ‘mom’ asked the teacher about the handout, she was told that her son was not supposed to bring it home…no kidding! The teacher claimed to have printed it by mistake. Now was time for the public school to go into full defensive mode. The teacher said she was ‘caught off guard’…maybe just caught. ‘Mom’ then reached out to the principal on how this material ended up in a third grade classroom. He was cordial and promised to investigate. That was in 2014. In 2017 she was still waiting on an answer. The superintendent of the Elizabethton City school system was “horrified’ when he read the contents…was it the ‘contents’ or being caught? He assured ‘mom’ that it was never intended to be handed out. The president of Parents for Truth in Education, a Tennessee based group that opposed national Common Core, said that though there was no identifiable connection between Common Core and the Nation of Islam assignment, the fact that students were cautioned against allowing their parents to see anything of their school work is troubling. It would appear they don’t want parents to know what their children are learning. [Julie West, in communications with Todd Starnes, October 2014]. Further she reminded the interviewer that these were not advanced high school students but third graders who were supposed to be learning the basics of our country. Is it that the Koran is permissible in school and the Bible is not? Is this just another indication of the ‘unraveling’ of our nation? One more story for this week. As you might guess it comes from a California university…institute of higher learning? A group of university professors signed a letter showing solidarity with six students who passed a resolution that would have banned the American flag at the University of California, Irvine. According to the students the American flag contributes to racism…professors signed in agreement? The resolution claimed that nationalism including US nationalism, contributes to racism and xenophobia, and is often used to intimidate. [“UCI Student Support Letter” accessed December 17, 2016]. And to think that these professors can sleep at night knowing that their salaries are paid by ‘nationalist pigs’. The UC Irvine student government association voted to remove ‘Old Glory’ from a campus lobby for the sake of cultural inclusivity, after all the American flag has been flown in stances of colonialism and imperialism. [Matthew Guevara,”Flags and Decoration Adjustment for Inclusivity”, no. 81, R50-70, March 3, 2015]. Of course we wouldn’t want to consider Iwo Jima, Normandy, and all those other ‘minor times’. Breitbart quoted an unnamed student who said the student government association feared the flag might hurt the feelings of illegal aliens. However, there is a glimmer of hope even in a university. The executive leadership of the student government met and vetoed the proposed resolution. The flag was once again posted in the campus lobby. I couldn’t help but wonder how many of the anti-flag students were receiving student loans/grants given by the very government that is represented by the flag? As a TV show used to say many years ago…there are a million stories in the city, this is just one of them. Today’s stories have been relatively tame. They will get more aggressive toward Jesus, the Bible, and Christianity in the weeks to come asking Christians where they will stand when accountability is called for?